Exactly nine years ago the first PocketShip emerged from the building shed. There had been no market research, no polls, no focus groups; it was simply a boat I wanted for myself. She was designed to weigh no more on the trailer than my small Honda could tow, and to have a roomy cockpit and cabin. Above all she was to sail well, really well. 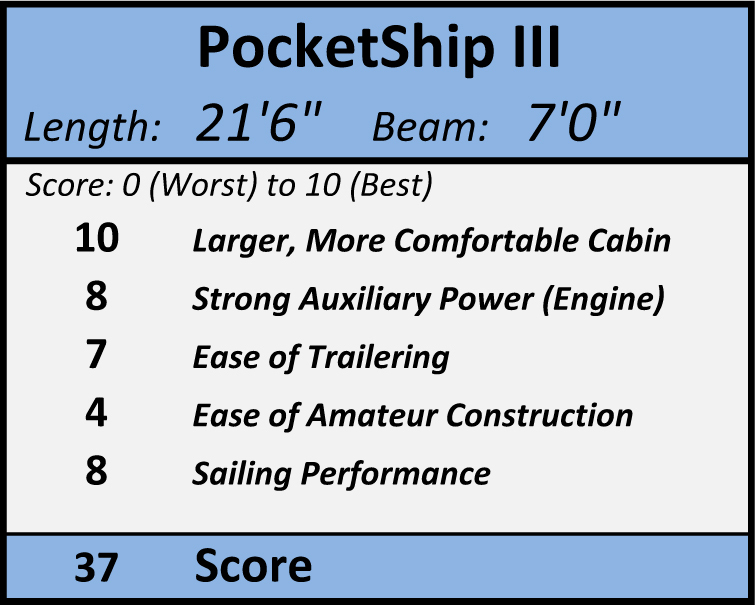 PocketShip #1 has been sailed hard for nine years and is one of the rare designs I feel no impulse to improve. She'll claw to windward when it's blowing old boots, but ghosts along on a zephyr so easily that I rarely ship the outboard engine. With four adults in the cockpit (a payload I never anticipated) she seems to brush off physics and boils ahead, often embarrassing larger boats. In the presence of witnesses she has reeled off seven knots, a speed/length ratio of almost 2.0. On the strength of her early showing, I decided to invest in a comprehensive assembly manual. When people tell me why they chose to build their own PocketShip, it's seldom because of her sailing prowess, or her wholesome looks, or her long legs as a cruiser. It's almost always because there's a pre-cut kit and that vastly detailed 280-page manual. 1. 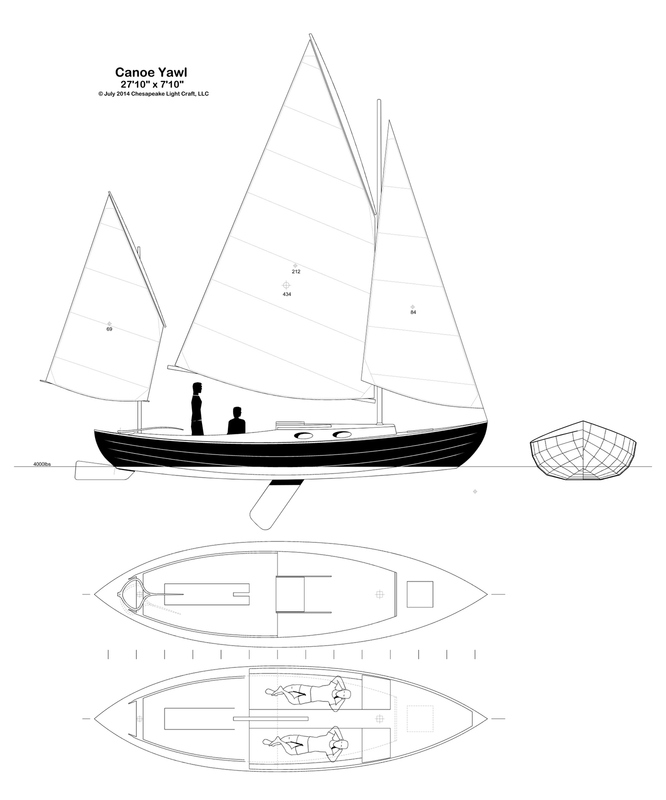 Will you be designing a larger PocketShip? 2. How big an engine can I install? 3. Is there room for a toilet? 4. How many adults fit in the cockpit? 5. 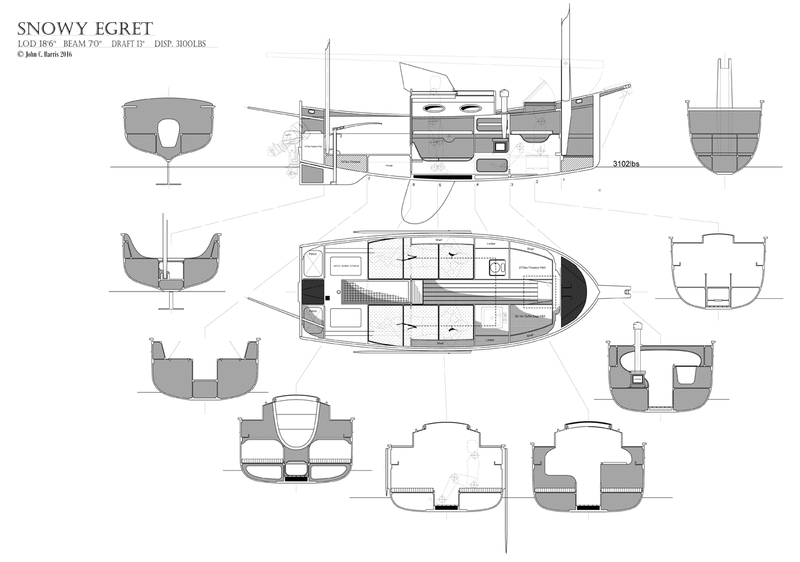 Could PocketShip be converted into a powerboat? I am a notorious doodler of boats. It's what I do when stuck on the phone, waiting on a plane, or late at night after everyone's gone to bed. My files bulge with "larger PocketShip" ideas. I'm going to dump a bunch of them here, and for education and entertainment talk about why some work and some don't. Keep in mind that none of these are complete designs. While in all cases the major engineering and naval architecture chores are complete, to the extent that the boats will float and work as intended, none of them have anything like enough documentation for a home builder. In most cases, the drawings you see here are ALL THAT EXIST. This unfinished drawing suggests that I was unhappy and moved on. I can see why. 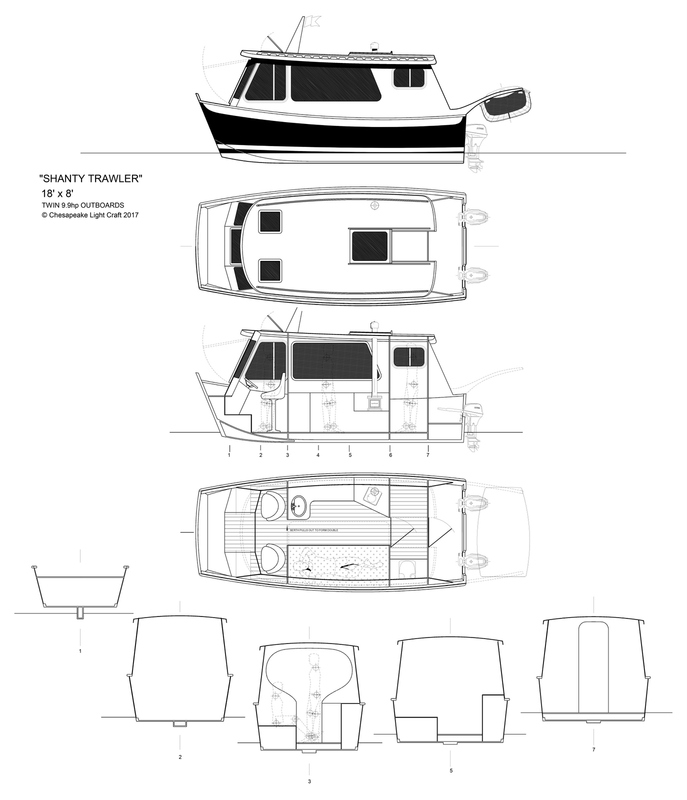 Given a popular design, the usual routine is simply to add a few feet of length to yield a roomier, more comfortable boat. 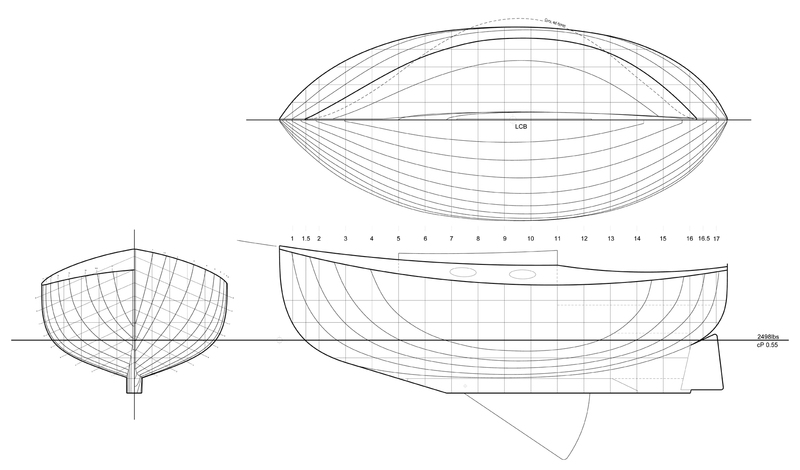 That appears to be what I've done here, a simple stretch of PocketShip from 15'0" to 18'6". Add a mizzen and an outboard well, and boom! you've got the next big thing. While there's a rationale for keeping the fine entry and long, flat run of the original PocketShip, the resulting lines are uninspiring. 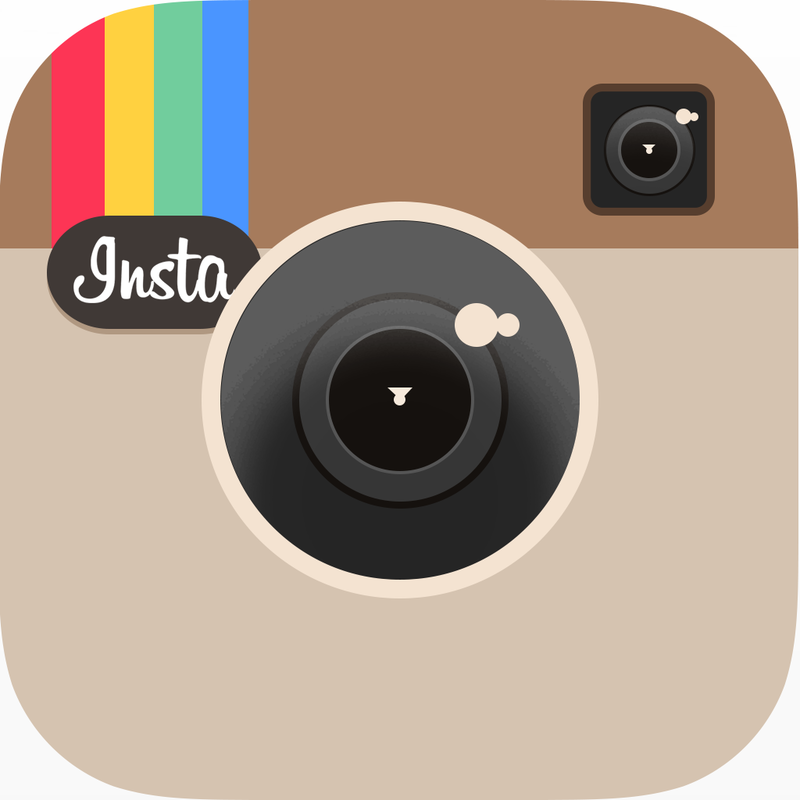 Neither ugly nor attractive, simply uninteresting. You've gained 23% more volume, but not much more headroom. Piling on several hundred additional hours of construction time rewards you with a boat that's more expensive, harder to transport and store, and probably doesn't sail much better. A dead-end, but illustrative of the challenge. In terms of time and money, the original PocketShip works because she's SMALL. 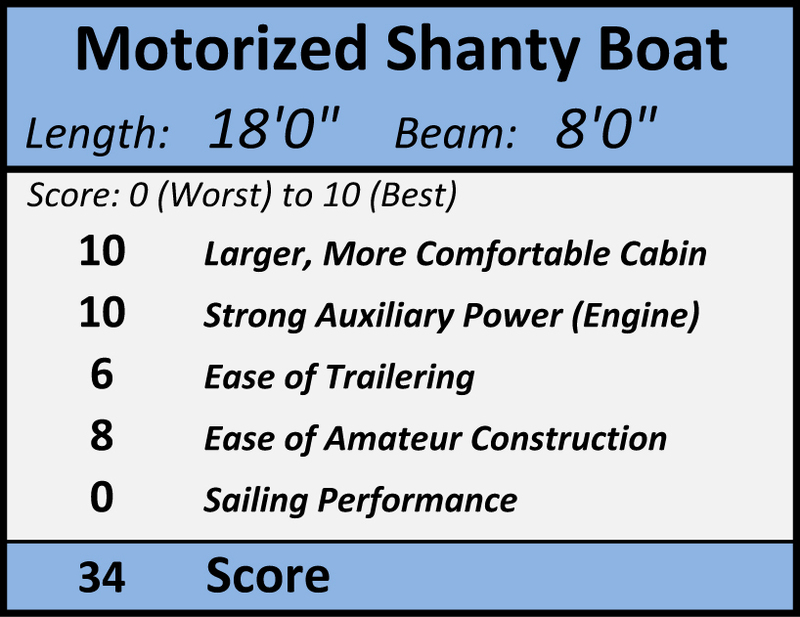 It is entirely plausible to build and outfit a PocketShip for less than you'd spend on CraigsList for a boat of equivalent size and performance. The costs increase in a non-linear fashion for both builder and designer as you push beyond the one-scarf-joint barrier of 15-16 feet. Meanwhile, in the year 2017, the North American used-boat market is overflowing with fiberglass pocket-cruisers in the 16 to 21-foot range. Most are being sold off by the pound. The desirable ones like the Montgomery 17 are dropping in price, enough that prospective backyard builders should perforce undertake a hard-nosed cost/benefit analysis. Refitting a 25-year-old boat is less romantic but it'll get you sailing a lot faster. Conclusion? 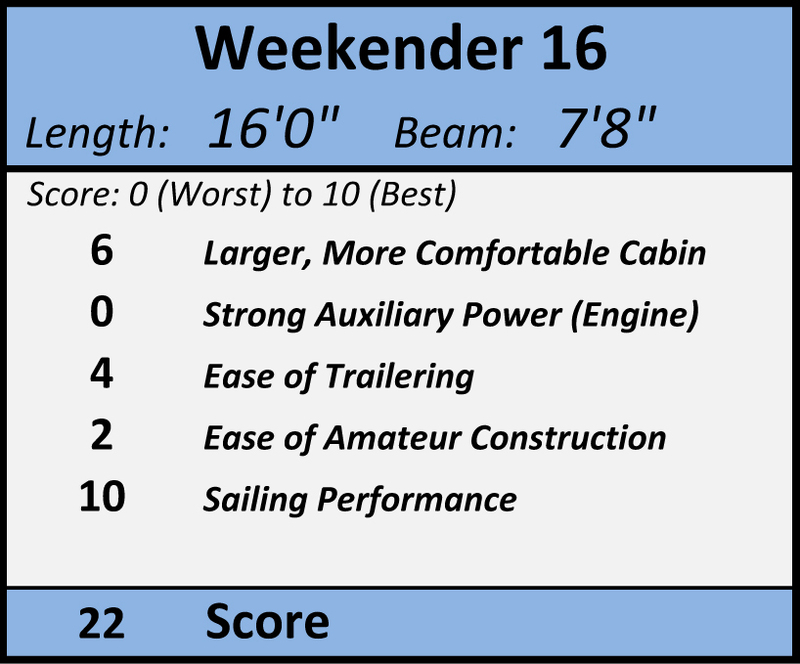 If you're going to build an 18+ foot cruising sailboat, it had better be because the performance parameters of your homebuilt project exceed anything you can find on CraigsList. PocketShip 18-6 isn't it. At some point I circled back and sketched this 21'6" concept. It's a more attractive boat, with the outboard engine concealed in the raked transom. It's lapstrake plywood, so it'd be quicker to build than the equivalent fiberglass-over-sheet-plywood approach. When I finished shading the drawing, I was struck at once by its resemblance to the Shrimper 19 by the British builder Cornish Crabbers. 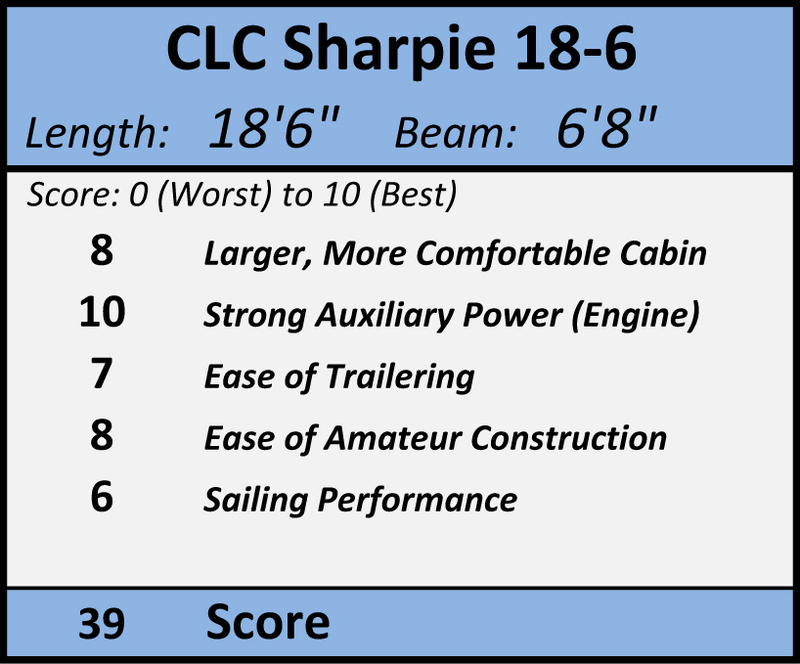 While relatively uncommon in the US, used Shrimper 19's can be found for about the same cost as PocketShip III's pile of materials. Even if I wanted to release such a confusingly similar design, the economics don't support it. Might as well get this one out of the way! 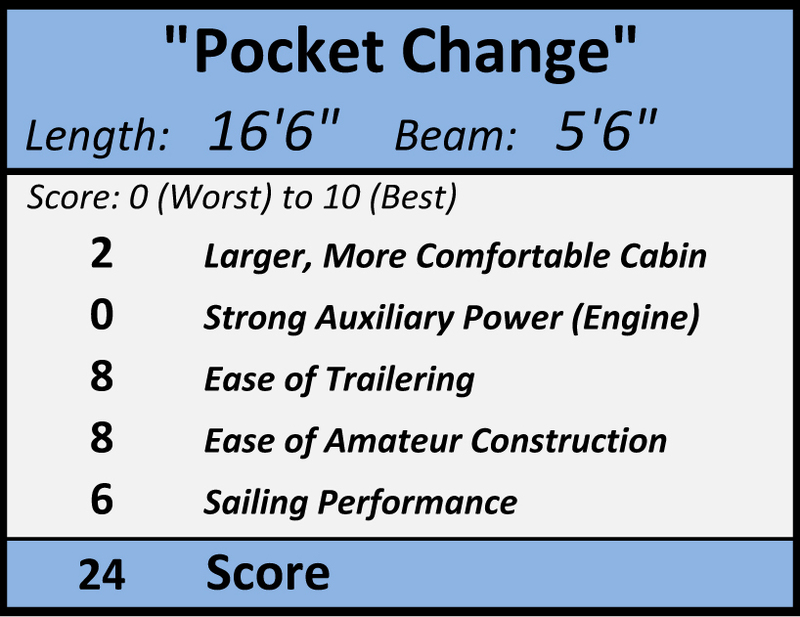 Pocket Change was an attempt at a cheaper, quicker-to-build variation on the PocketShip theme. 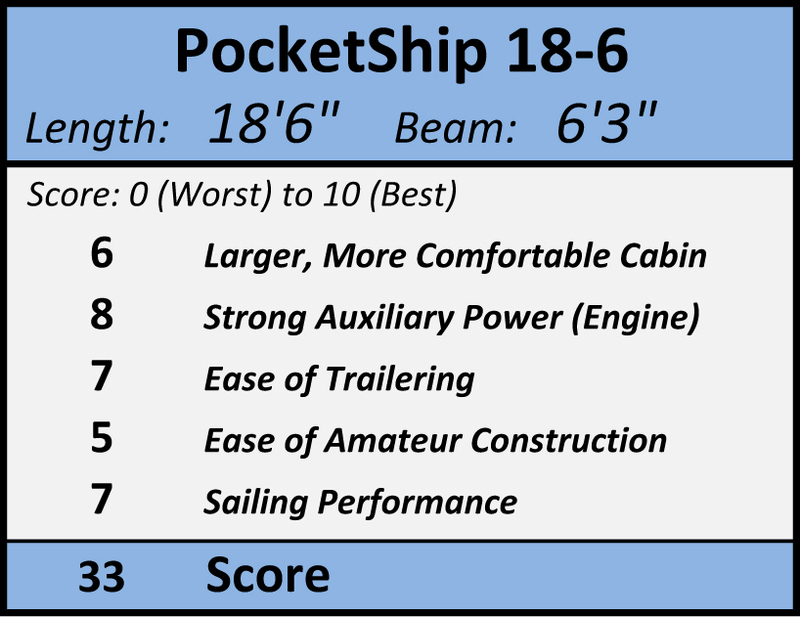 While 18 inches longer it's actually a smaller boat (by volume) than PocketShip, and thus doesn't belong in this piece at all. But versions of this sketch got loose on the internet some years back and generated some buzz, deserved or otherwise, so a few sentences of explanation are in order. Pocket Change can be hammered together from fir plywood and requires only a fraction of PocketShip's epoxy. (Epoxy is the largest single expense in a PocketShip other than the sails.) Plumb sides and a pointed stern further reduce the joinery involved. It never went any farther than this because PocketShip does every single thing better, from sailing to accommodations. Cheaper it is, better it is not. Pocket Change evolved into the much more refined Autumn Leaves design, a niche boat that doesn't belong on this page any more than Pocket Change does. This design garnered the highest objective score. It's quick to build and reasonably inexpensive, as it doesn't rely so heavily on fiberglass and epoxy. As rigged it'd probably sail about as well as PocketShip. 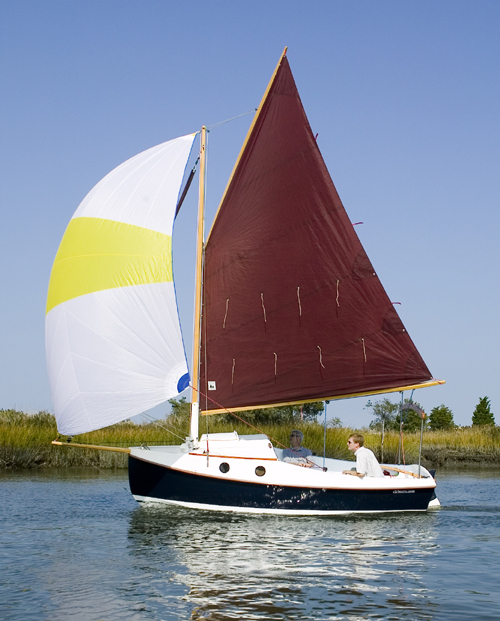 For the light airs of my native Chesapeake I think I'd opt for a taller, more efficient sailplan. A strong, secure centerline mount for the outboard guarantees auxiliary power when needed. The cockpit can house four adults in a pinch, and even sleep two on the benches. Thanks to the leeboards the interior is spacious and relaxing, shown here in singlehander or doublehander versions. The tall house gives you enough headroom to pull your pants on (but not stand upright). A tiny woodstove may be squeezed in for cruising in the shoulder seasons. It's obviously derivative of my hero Phil Bolger's work, though I've raked the bow and stern a bit for looks. For comfortable coastal passages it would be hard to do much better in a trailerable boat. Despite scoring the highest on purely functional grounds, however, it's not my favorite here. My hesitation is philosophical, not technical. This boat would have made great sense in the 1980's, when materials were cheap and production-line pocket cruisers were expensive. With that calculus reversed, how badly do we need a flat-bottomed pocket cruiser design in 2017? This design's performance would match or exceed that of the common fiberglass cruisers in its weight class, but it would let you down in resale value. It's not that the boat is ugly; it has heaps of character. With all the motivation in the world to get people building boats in their backyard, I temporize because for just a bit more labor you might have something prettier. If you've been reading, you'll have gotten the essence of the "Harris Rule." 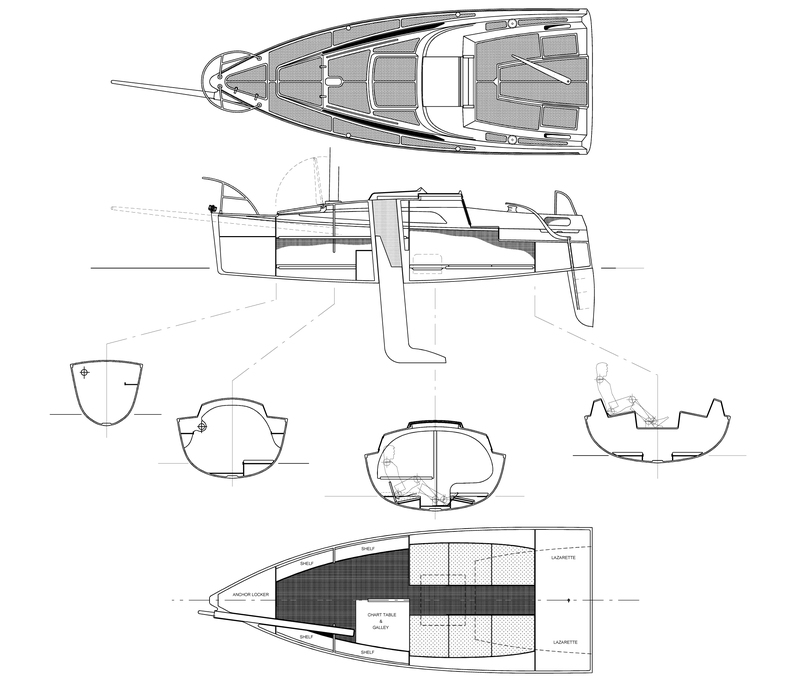 This eponymous maxim states that any design marketed for amateur construction MUST offer a compelling economic case when compared to buying a good used boat. The build-it-yourself design won't find success unless it is cheaper for a given performance metric, or offers higher performance overall, or simply fills a niche not supplied by mass production. 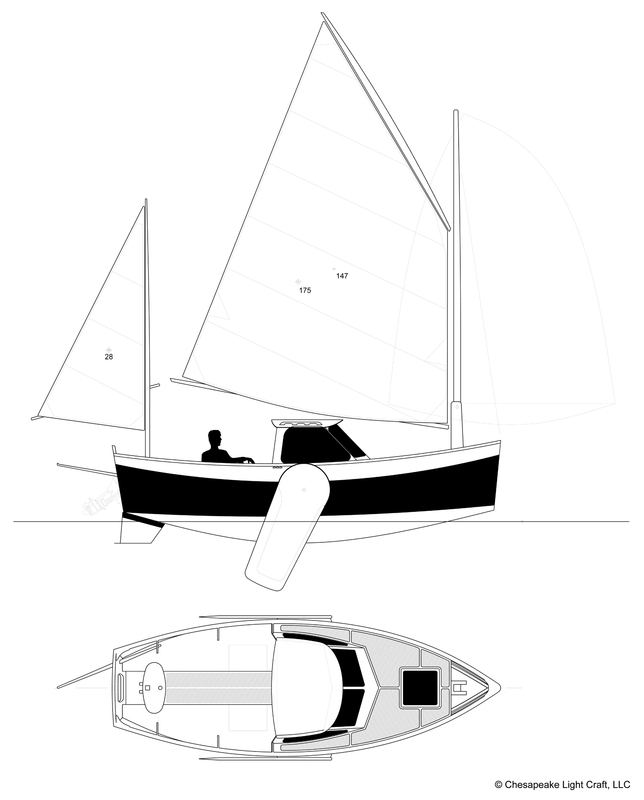 Building a boat larger than PocketShip is a huge commitment, so besides making sense in terms of time and money, such a project ought to tug at your heart strings. Joy Spring is a pretty boat from every angle, fast and fine-lined. By using CLC's LapStitch™ scheme she'll come together more quickly than the 23-foot length suggests. Length, of course, is NOT size. 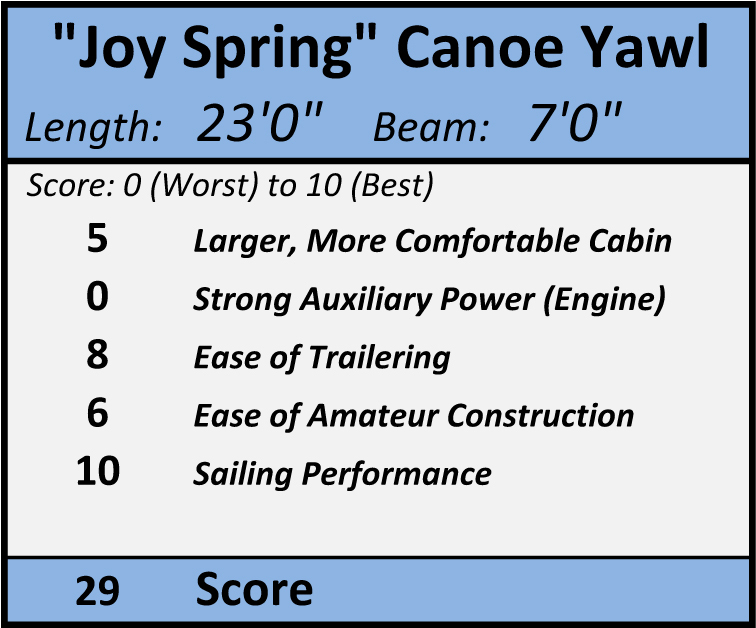 Joy Spring is long and narrow but not especially voluminous, which is appropriate for an engineless canoe-yawl. A dozen different sketches of this design, all with more elaborate interior arrangements, suffered from an excessive parts-count that ran up the hours and cost. 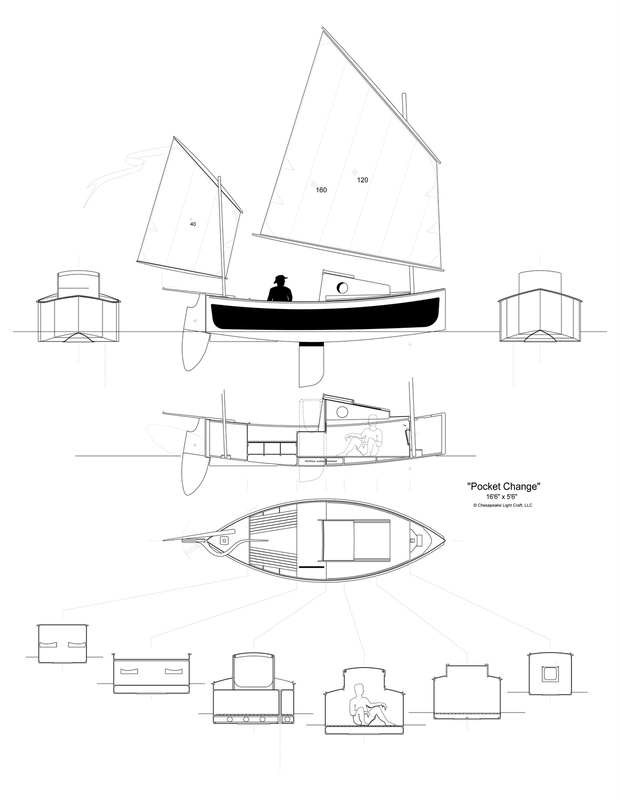 Eventually it occurred to me that PocketShip's simple interior---a romper room spread of nicely-oiled floorboards, and little else---was entirely in character for this boat. With that one stroke, the Harris Rule was surmounted and we arrive at something interesting. 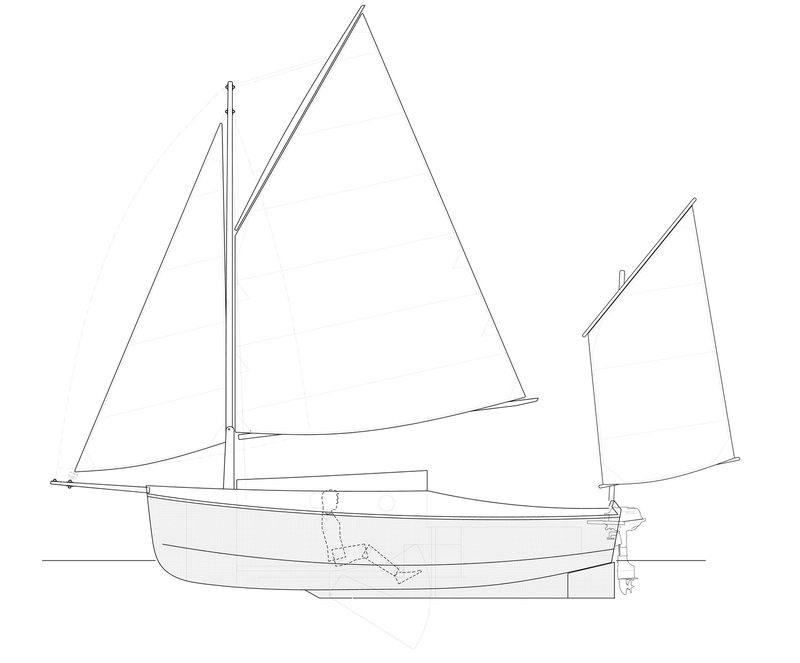 Joy Spring would need quite a lot of inside ballast to stand up to her sail, again a feature idiomatic to canoe yawls. The large volume under the floorboards suggests the possibility of water ballast, but having designed a number of those I am not a fan. It takes a long time to build a watertight tank (like building a boat within a boat), and it takes up a lot of room compared to lead. The most troubling thing about water ballast is that its weight is suddenly neutral in a catastrophic swamping. Whereupon the ballast abdicates its responsibility to keep the bottom facing down and the top facing up. I prefer lead. On the bright side, ditching PocketShip's keel-centerboard arrangement makes the boat both easier to build and easier to get onto a trailer. 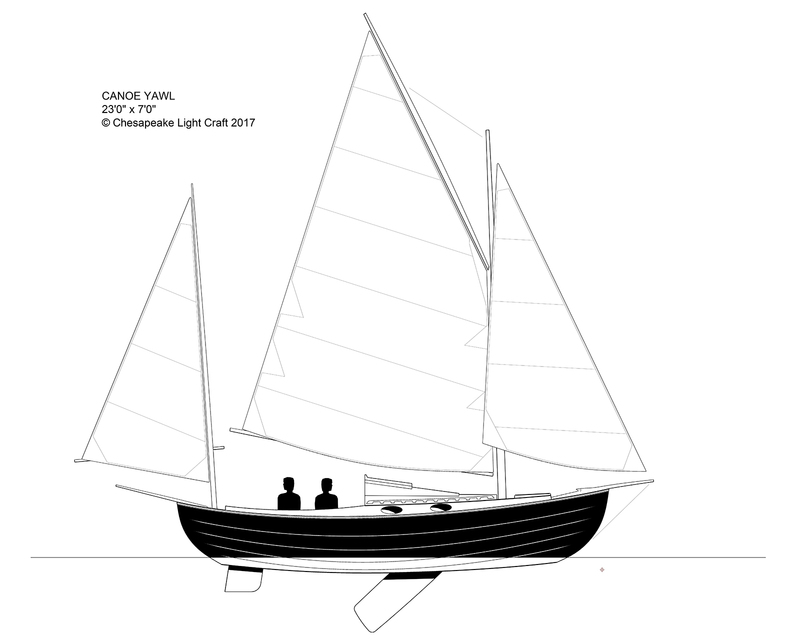 Because this is a canoe-yawl and I am a purist, there is no engine, which will put it out of the running for the PocketShip-Question-#2-and-#5 crowd. I suppose the cockpit could be fitted with a well for a small outboard engine, but it would rob the design of its sailing-geek purity. You're meant to ship a long sweep oar. What a lovely thing to see ghosting up to a mooring on the last of the evening breeze. I should like one myself. Thematically similar to Joy Spring, this sketch was created at the request of an experienced small boat cruiser who wanted a light cruiser suited to the shallows of Florida and the Bahamas. I think I meant it to come in around 24 feet, but when the drawing was finished it had grown to almost 28 feet. No matter how simple you make the construction of a boat this size, building such a thing is a life-altering commitment, requiring a big barn and several thousand hours at least. 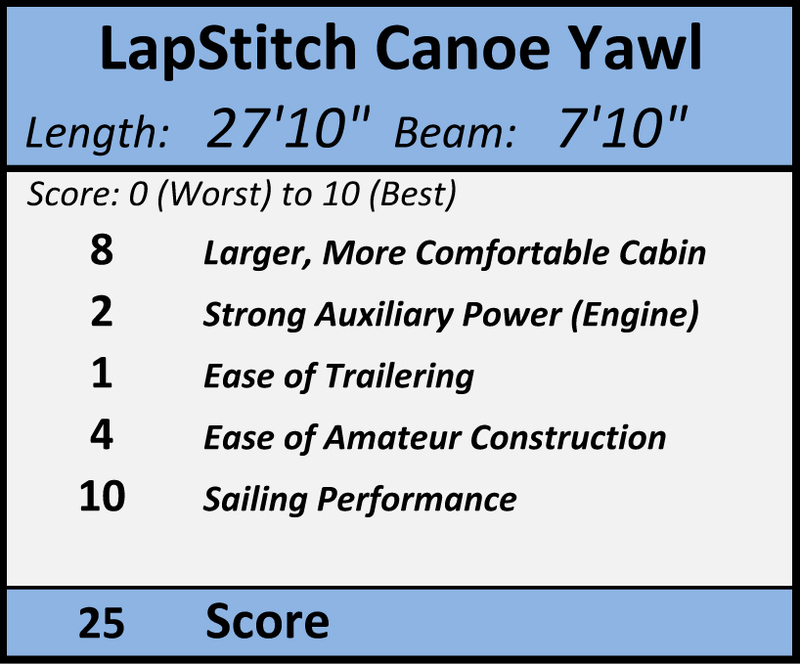 You're hard-pressed to find a boat this capable in the marketplace that floats in 12 inches of water, so it's somewhat Harris Rule compliant. But you'd have to REALLY want one. The prospective builder didn't, so the commission went no further. Variations of this sketch have hung in the admin office lavatory at CLC for some years. I never had any thought of building it, but enjoyed doing something different with the usual 30-foot cruising yacht formula. 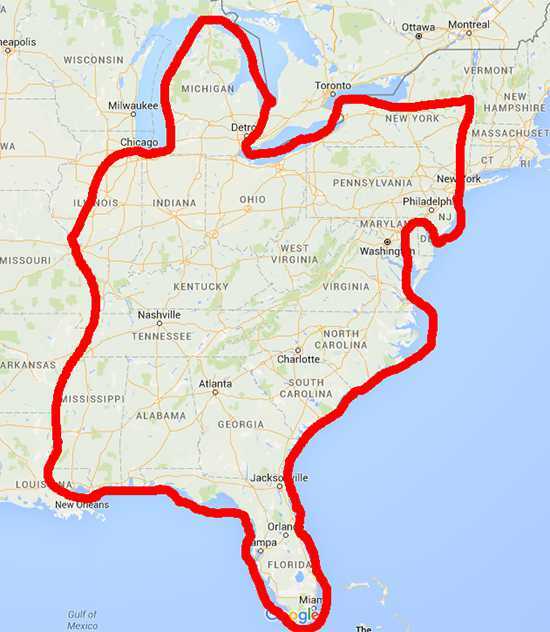 (It's relatively skinny so that it can be transported on the road without a wide-load permit.) I just noticed when uploading the drawing that I remembered to leave some space between the wood stove and the settee in the plan view, but not in the elevation view. That'd be scorched upholstery, there. I include it to spur conversation about the idea of amateurs undertaking such large projects. It seems like not a single yachting magazine from the 1920's through the 1960's went to press without at least one such build-it-yourself design. I have no statistics on how many amateur-built boats this size made it from the backyard to the water, or even from drawings to the backyard. I suppose the tsunami of fiberglass cruising auxiliaries that appeared around 1960 displaced many dreams of building a cruiser and sailing away. In 2017 you can be off and cruising in a well-found fiberglass boat for a good bit less than the diesel inboard installation in this one would cost you. I would do it not because I had to, but because I love building boats. It would be magical to watch the beast grow in your back garden. There are still a few people like that around. And if willing to set forth on such a journey, they've got 75 years of dreamboat designs from which to choose. A different design direction, from about 15 years ago. Even then the styling would have been a bit dated. 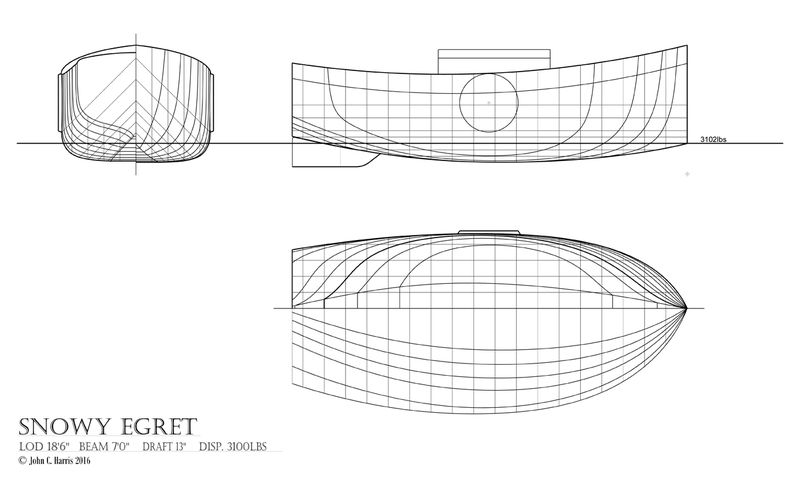 Nowadays the bullet-shaped plan view would be married to a hard chine running from amidships to the transom. I dredged it up because I think it's a nice piece of drafting, even if it doesn't have any more relevancy than the "Fifie Yacht." The 6.5-meter length suggests that it's a detuned version of the bonkers Mini 6.5's they race across the Atlantic every other year. The name derives from the labors I undertook to give the canvas cockpit dodger a solid base in the integral cockpit coaming. Very pretty, but such a detail would be hellish for a backyard builder. Realizing that the entire deck would likely require a female mold, the sketch was quietly put aside. This idle sketch makes it into the article because it was inspired by PocketShip. PocketShip has a waterline length of only 13'9" yet manages to sail like a damn witch. If 13'9" marks some sort of sweet spot for miniature sailboats, how far can you take a 13'9" waterline? However impractical, the results of the thought experiment are entertaining. The lines of a British fishing smack or pilot cutter are easy on the eye, and while frightfully heavy, these boats can show a startling turn of speed in the light-to-moderate airs of my home waters. All that weight (3000lbs) combined with a towering rig and a fine bow mean you punch through motorboat chop and keep coasting along in lighter airs while lightweights like PocketShip just bob up and down. Pure whimsy, broadly impractical, and amateur builders need not apply. Let's throw her a few points for looking as handsome on the trailer as she would in the water. This was set down not long after the CLC Sharpie 18-6. "If we're going to be spending twice as much time and twice as much money building the boat," I said to myself, "you might as well escalate just a little more and try to make something truly special." 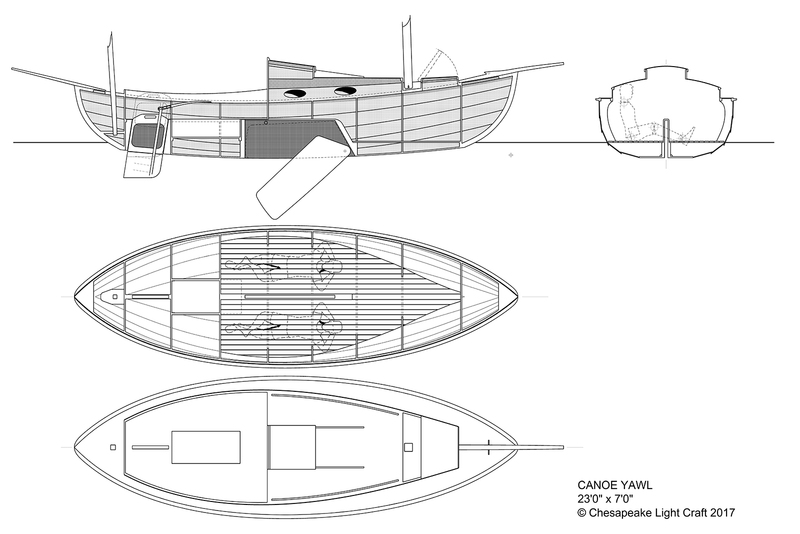 Thus, the plywood is jettisoned in favor of a shapely, round-sided, strip-planked hull. The increase in labor is minor compared to the total hours required, but you get a prettier boat, one likely to actually be worth something when it's time to sell. This is a yacht. With the plumb bow, hollow waterlines forward, and that nice wineglass transom, she'd be striking both on the water and on the trailer. You'd be especially struck by her SIZE sitting on the trailer; she would loom over you, looking a great deal bigger than 18'6" long. 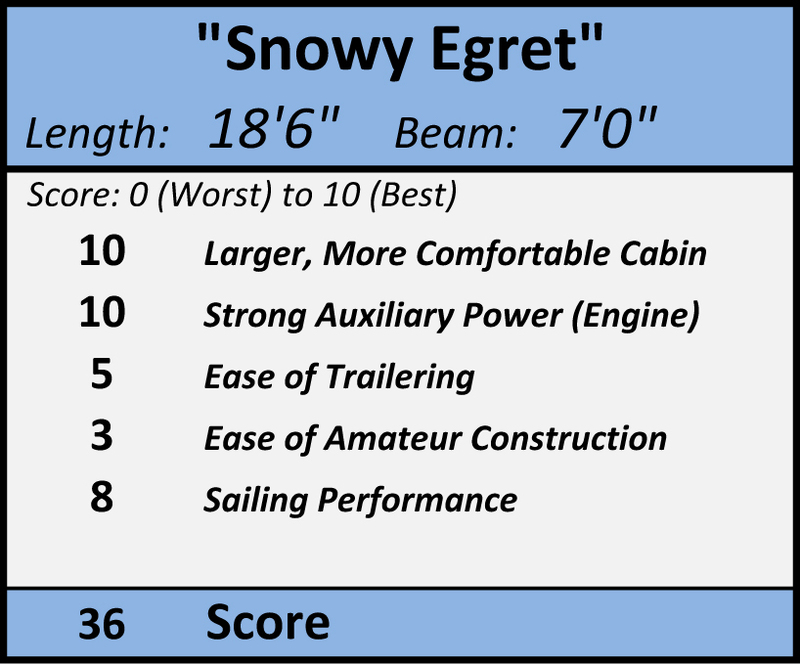 Illustrating once again that "length" is not "size," Snowy Egret has a hull volume of 410 cubic feet, versus 182 for PocketShip. She's tall and wide, and would certainly feel like a much larger boat. Displacing a ton-and-a-half, she'll need a tall rig to get her going but with a shallow underbody she'll show a decent turn of speed. I like the looks of the full-battened yawl but the 33-foot freestanding main mast (!) should give pause to all but the most committed sailors. While I'm not the biggest fan of leeboards, without a centerboard bifurcating the cabin she's as roomy as many boats six feet longer. There are two large berths over seven feet long, a galley, and space for a curtained-off chemical toilet forward. And of course that most genial of cruising companions, a cast iron woodstove. For those who want to set up house in their pocket cruiser, here's one with plenty of elbow room. Maurice Griffiths' lovely and evocative books about small boat cruising in the Thames Estuary before the War were the main inspiration for this design. 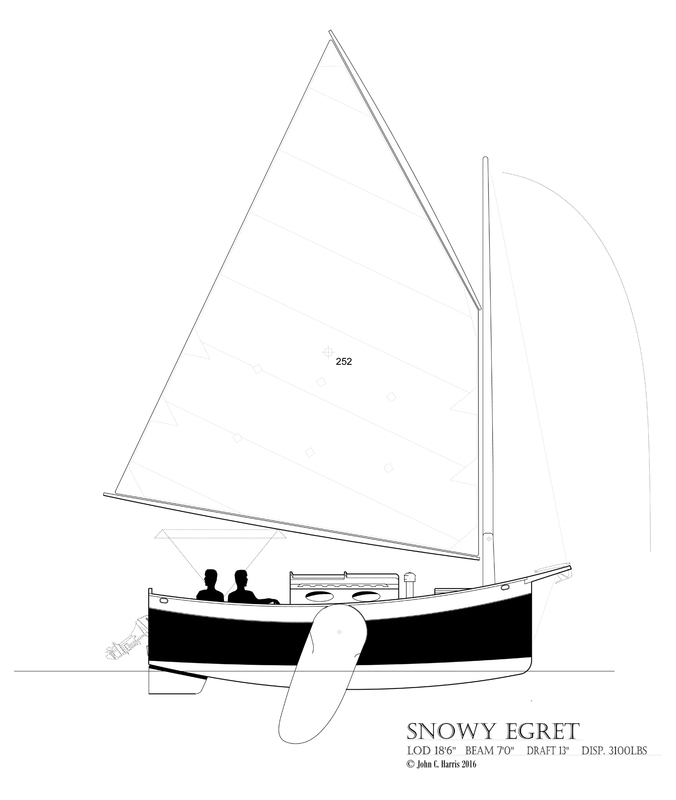 I'd like to think he would approve of Snowy Egret, with her shoal draft for slithering up creeks combined with a strong, stable hull capable of rough crossings in ugly weather. The transom provides a secure centerline mounting for a large and powerful outboard, up to 10hp. 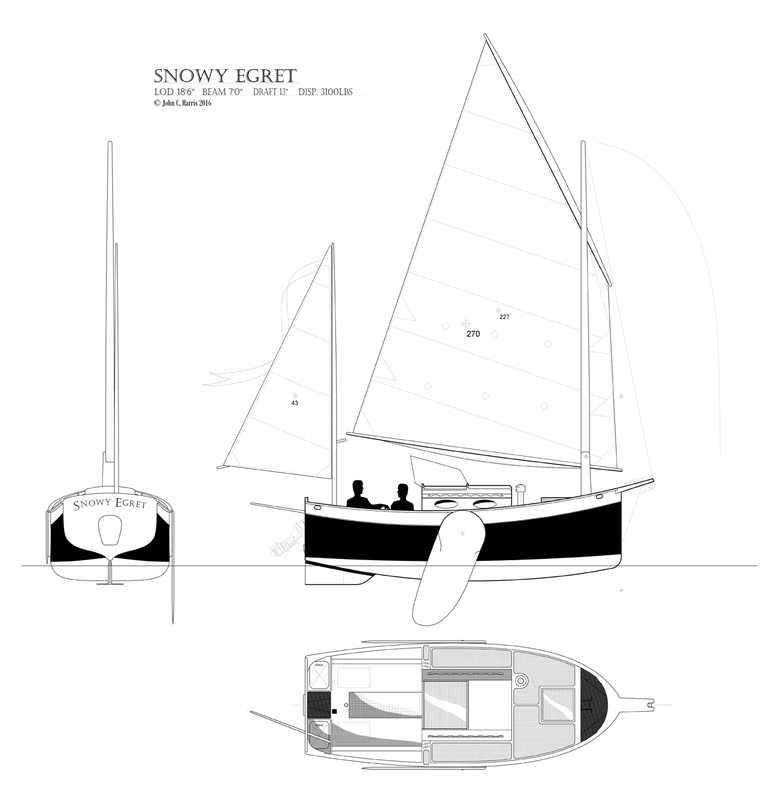 Opting for one of the rigs with the main mast in a tabernacle, Snowy Egret would be a great choice for intracoastal and canal cruising. The Great Loop, for example. The hull is strip-planked and sheathed in fiberglass. 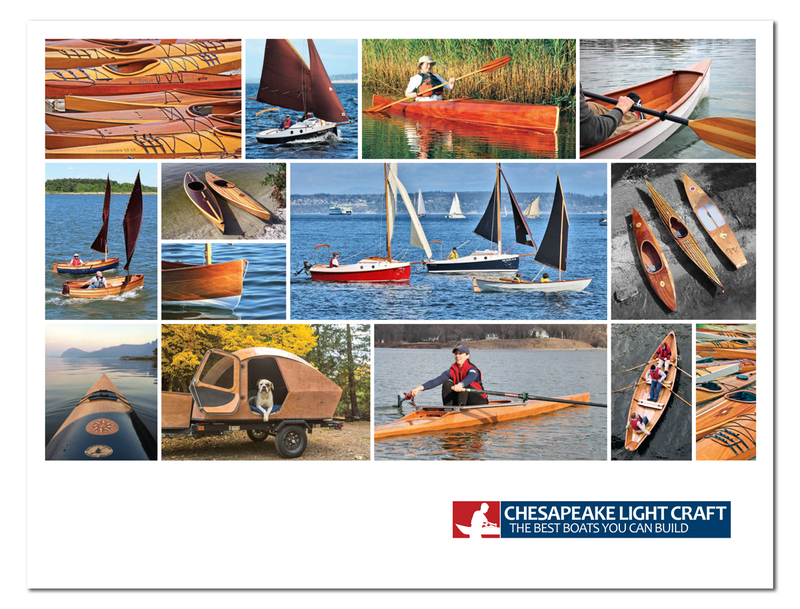 This would not be your first boatbuilding project, but someone who is patient and has gotten through a strip-planked kayak or two could manage it. 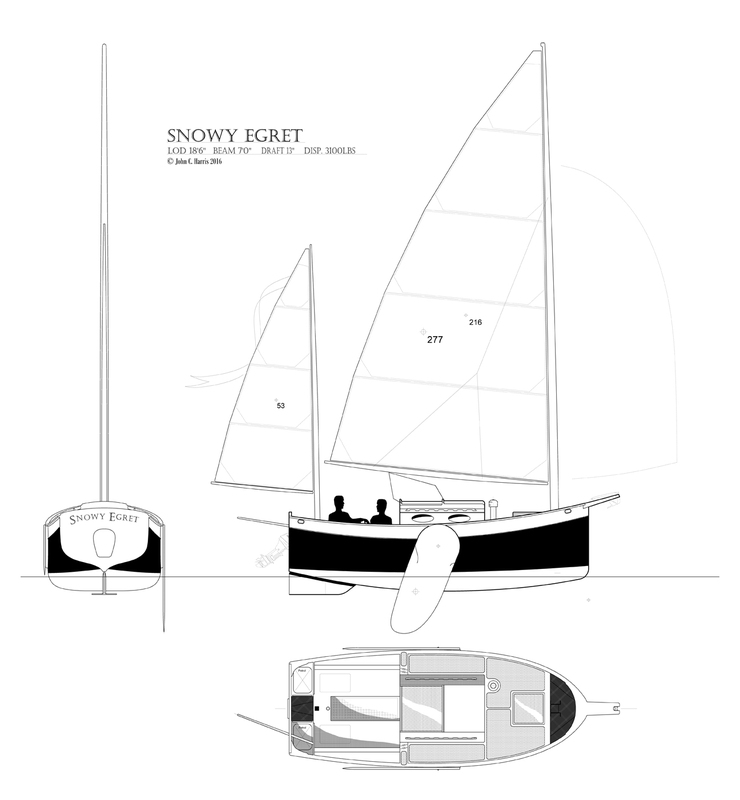 There are plenty of arguments in favor of the round-bilged hull, the most persuasive being that once the hull is off the mold, the fitting of interior, deck, and rig will take just as long in Snowy Egret as it would in the CLC Sharpie 18-6. What's not to like? Well, with a yacht finish this is a 1500-2000 hour project no matter how you slice it, requiring real dedication. 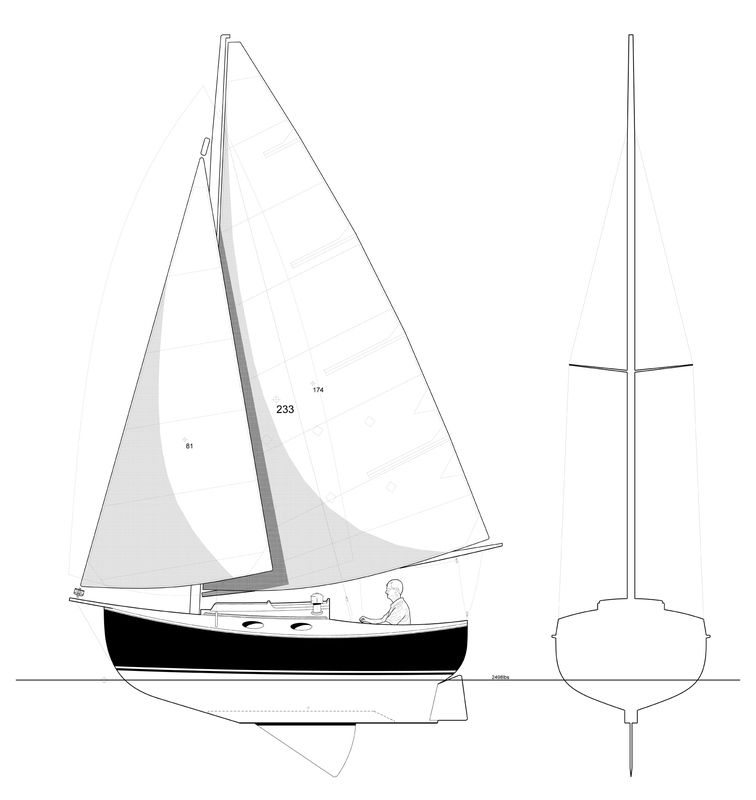 If you had her built by a professional shop, the sail-away price could easily drift into six figures. A backyard builder would spend $20,000 by the time she's hoisted onto a double-axle trailer. If I set out to build myself a PocketShip replacement tomorrow, one with a spacious cabin and longer legs, this would be the one. I've spent many hours imagining her in white paint with a light gray sheer stripe, varnished heartwood cypress house sides, and white oak trim, moored in a quiet creek while a Northeaster gale blew itself out. As the rain pattered on the deck I'd sprawl in my berth with a good book, a pot of tea kept warm on the stove. Absolutely content. Reverting to the homebuilt boat as objet d'art, the joy of its construction an end in itself, a contribution to the beauty of the waterfront, here we have a little canoe-sterned yacht just 16 feet on deck. 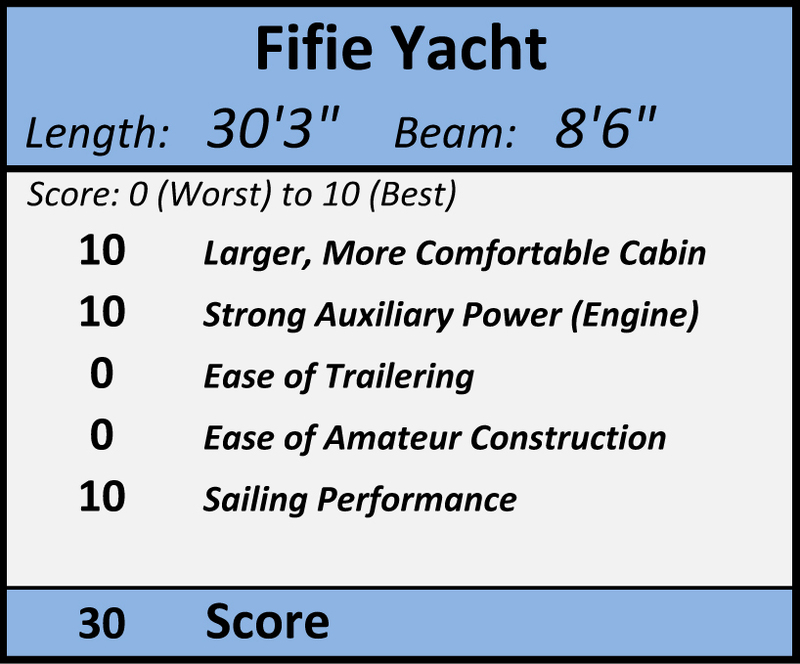 It scores low on our PocketShip-replacement chart, but I have given serious thought to building one for the fun of it. This design targets the skilled amateur who might be contemplating something like the popular Haven 12-1/2 as a woodworking merit badge. 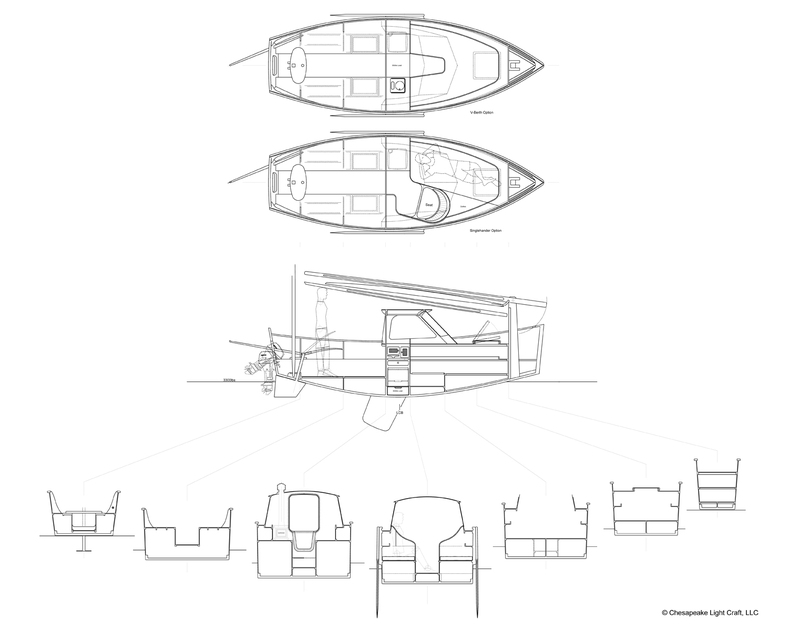 While strip-planked, with a number of design tweaks intended to ease construction, this one's for the serious boatbuilding geeks, only. 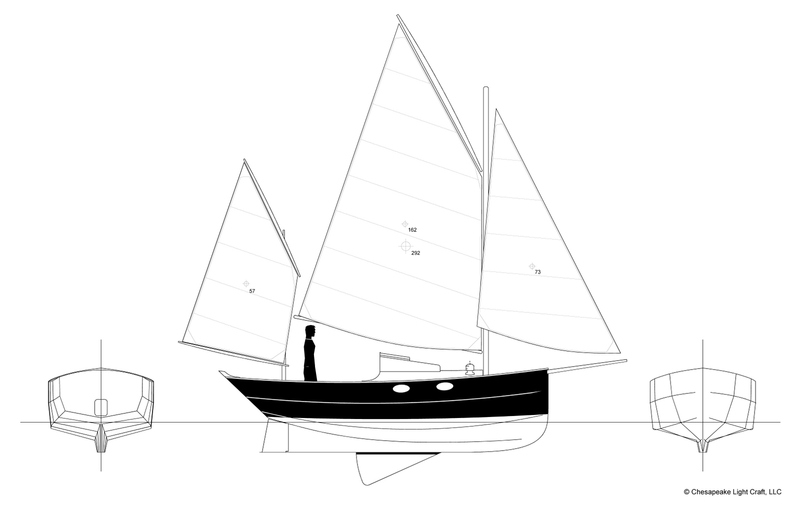 "I'd love to see John redesign PocketShip with a toilet, shower, and inboard charging diesel electric motor." That's an actual comment that appeared on one of PocketShip's YouTube videos. (A dozen typos are edited out here.) After I stopped laughing, I responded soberly that the inquirer should Google "shantyboat," and maybe consider mooring a nice daysailer alongside the shantyboat. 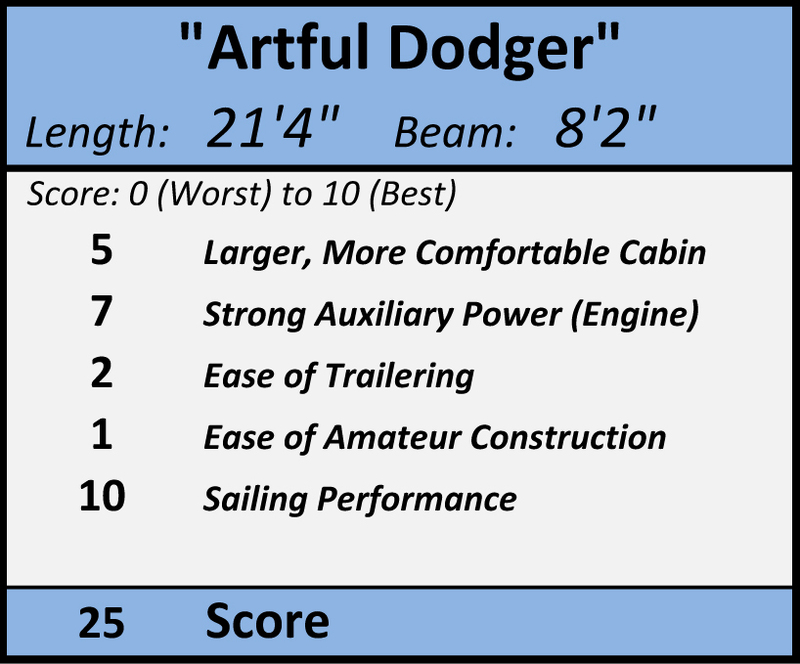 You're never going to have all of those features in a trailerable boat that can sail upwind, notwithstanding some laughable attempts over the years. Even the heaviest cruising sailboats rarely have hot running water until they get up over 30 feet in length. I love a good shantyboat like the next smallcraft-besotted dreamer. The idea of combining the comforts of a small shantyboat with the ability to move about relatively freely under power strikes me as one way to appease the contingent who can't abide the idea of sitting headroom. I enjoyed sketching out the idea late one evening. Here are most of the conveniences of a good RV, including 6'4" of headroom throughout. 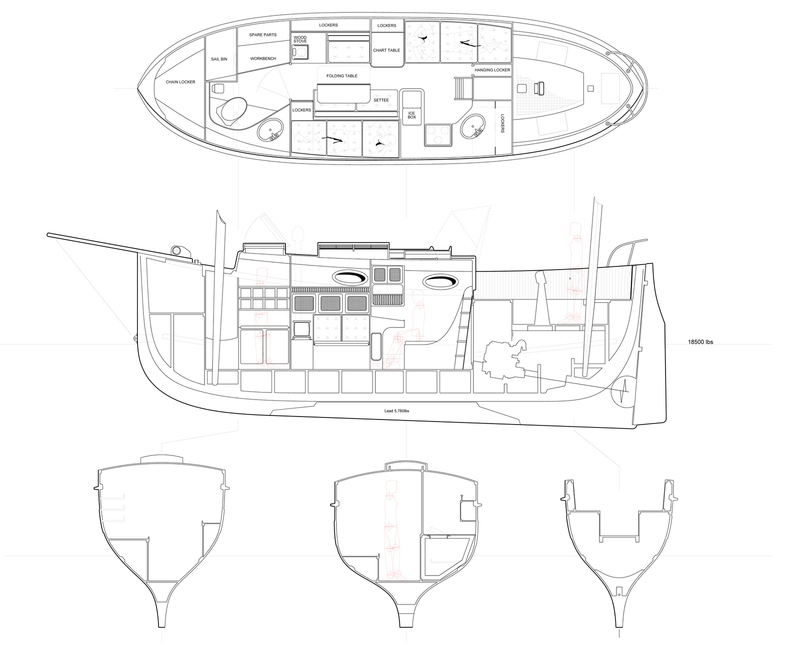 One big berth, a galley, the indispensable wood stove, and an enclosed head with space for either a shower or storage. (Or a generator.) 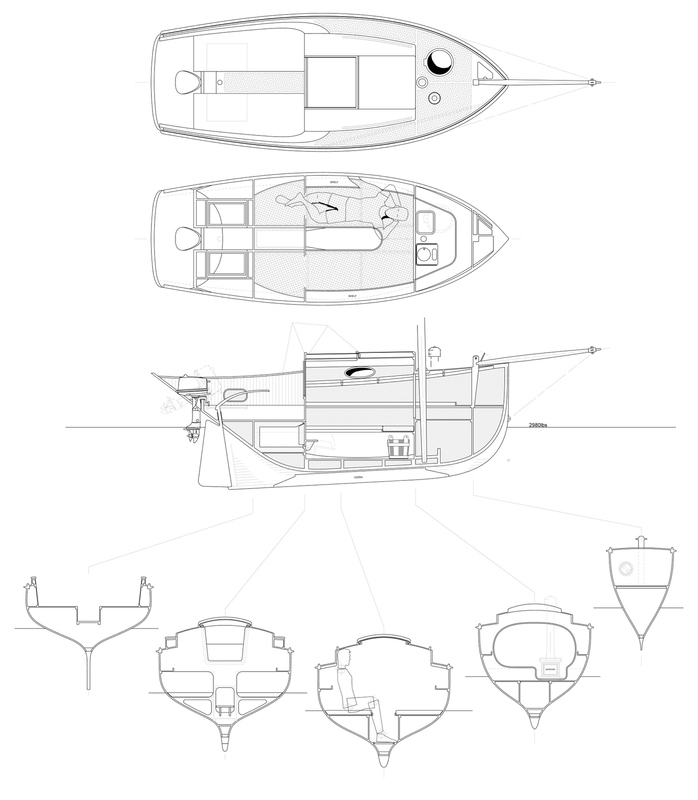 To stick with an arbitrary maximum length of 18 feet, all living is done indoors, with only a small cockpit aft to tend the twin 8- or 10hp outboards. Twins are more expensive, of course, but I was thinking that much embarrassment would be spared in crosswind dockings if you could work two throttles. 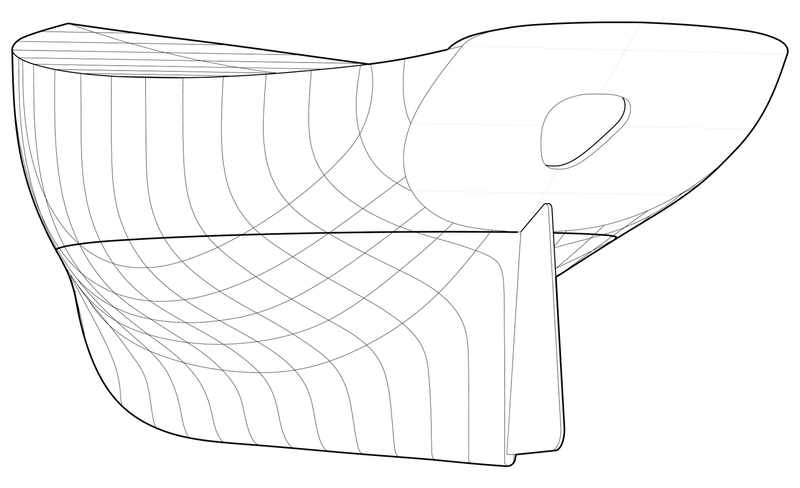 Yes, she'd plane in smooth water if lightly loaded, but this design is not meant to handle like a SeaRay. She will be perfectly happy stooging along at 5-7 knots. The sponson bow (stolen from Phil Bolger) will mitigate some of the pounding, but you'd have to throttle way back in a head sea. You'd make it to a safe anchorage long before a sailboat of similar interior volume would. Given a smart, alert skipper and careful construction I wouldn't hesitate to send her on the occasional rough crossing. Construction is straightforward, if not especially cheap. (There would be a great many sheets of plywood.) Not a sailboat, but if it's mobility and living space you desire in a trailerable package, this checks a lot of boxes. 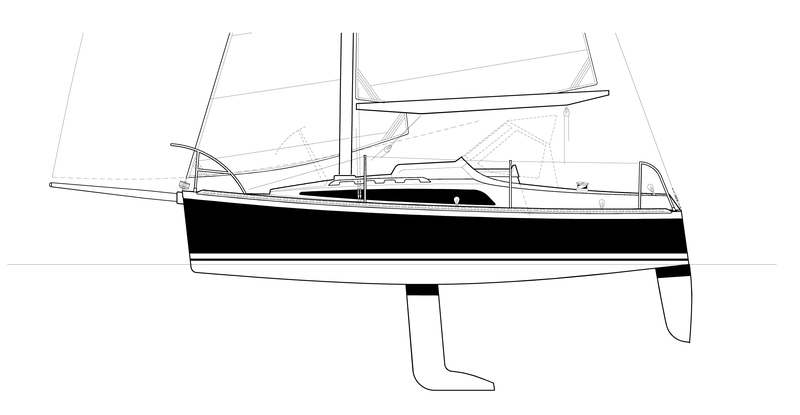 You could tow a good-sized daysailer in addition to the dinghy in davits. Funky-cool with a bit of 1960's vibe. I would dig the view out the big shaded acrylic windows. Voting has closed on this article. View the results and commentary here.